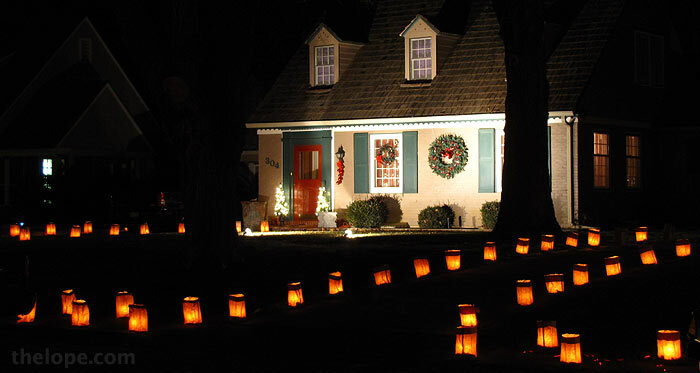 One of the most charming aspects of Hutchinson, Kansas, during the Christmas season is the annual luminaria that spreads over 36 blocks - east to west from Main to Monroe and north to south from 23rd to 18th. 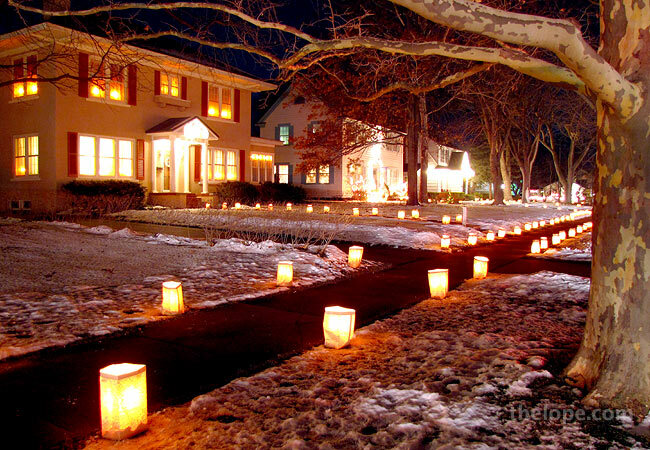 display of luminaria sacks (candles in bags anchored with sand) that engulfs the Hyde Park area of Hutchinson. 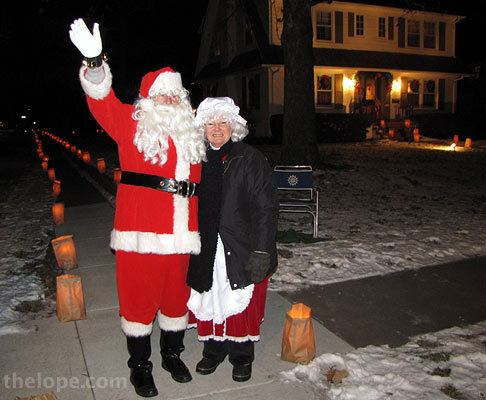 A certain Kris Kringle of the North Pole, with off-season residence in Great Neck, LI (Miracle On 34th Street reference), showed up to entertain visitors. This was no small contribution as the temperature was in the single digits. I suppose he's used to that, what with living at the North Pole and all. 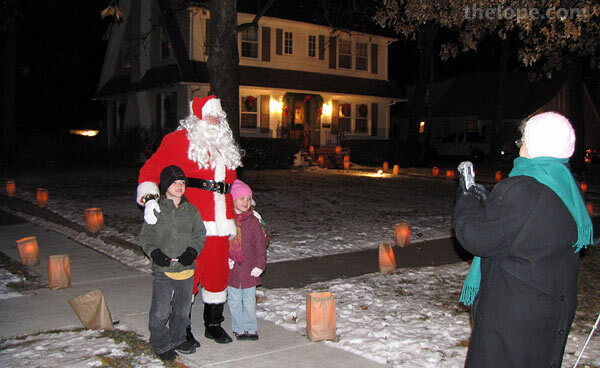 According to organizer Jim Sunderland, 253 homes participated in the luminaria, which started at 6 PM and ran until between 9 and 10. 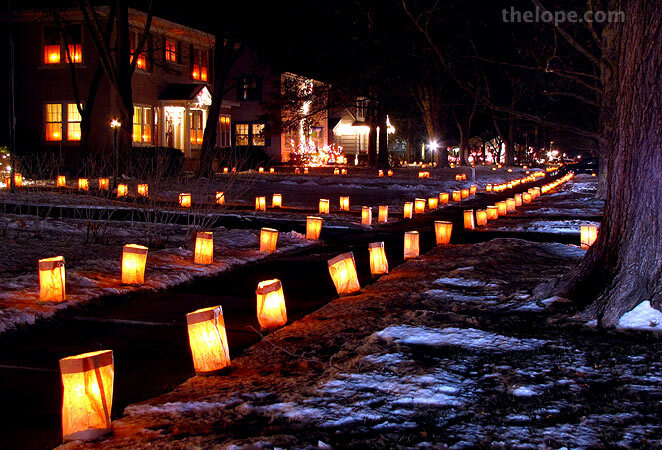 The luminaria began in 1983 and has occurred every year since, except for 2007 when it was cancelled due to the ice storm. Periodically it has expanded like a paper and fire amoeba. A collection of blow-molded Santas stands vigil on the garage of Gary and Gayle Ford. The red streak was left by a car's tail light as it drove down Washington Street. Many people turn their head lights off while driving through the more minor streets of the luminaria, but a police officer on hand told me this is still illegal. I didn't see any tickets given, though. 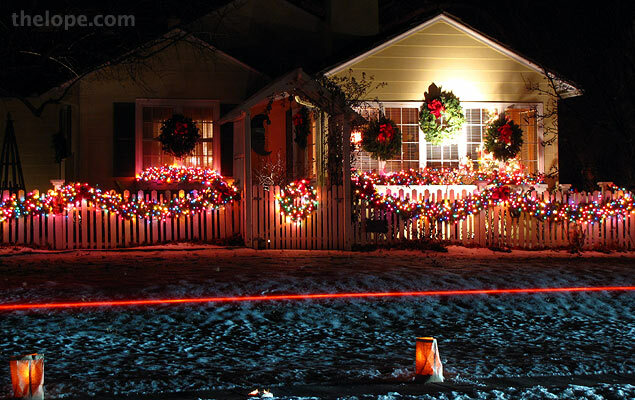 Many of the decorations in Hyde park tend toward conservative and elegant. 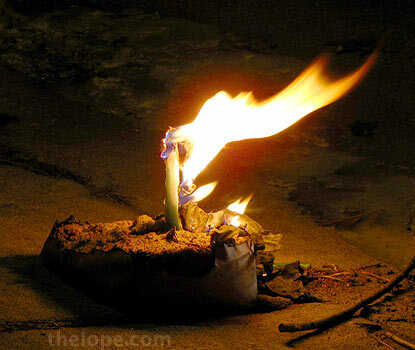 Once in awhile things get too close and fire and paper do what fire and paper do best. I saw some kids helping this process along a couple times as the event wound down around 9 PM; I'm sure that wasn't in the plan. 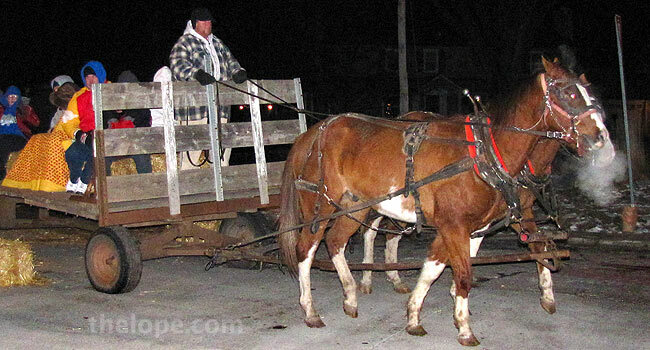 Wagon rides were offered. The steam as the horses breathed was rather pronounced. Another perk of the luminaria experience was hot chicken soup and cocoa served for a mere three bucks in the toasty-warm interior of Grace Episcopal Church. Just outside, a cub scout troop served free hot cider and cookies. Let me tell you, hot soup never tastes so good as when it's five degrees outside.